Artist Jewelry by Chris Steenbergen gold and silver brooch the rope jumper: Description by Adin Antique Jewelry. Defining from this design on the rest of Chris Steenbergen's oeuvre, this Dutch brooch is described as his signature piece, once in a private collection and now serving as a collectible piece of future antique jewellery. Representing a rope-jumping woman in silver with 14K yellow gold features glistening through from the back, this balletic figure symbolizes the grace and strength by which every modern woman moves through the hurdles of life. Furthermore, this particular brooch is pictured on page 16 in the catalog of the Museum Boijmans Van Beuningen, Rotterdam, Netherlands, named 'Chris Steenbergen, goldsmith' published in 1985. With this jewel, we will present the (Dutch) booklet 'Chris Steenbergen' by Marjan Unger (Stichting Fonds BKVB, Amsterdam, December 2000). Material: Silver and 14K yellow gold. 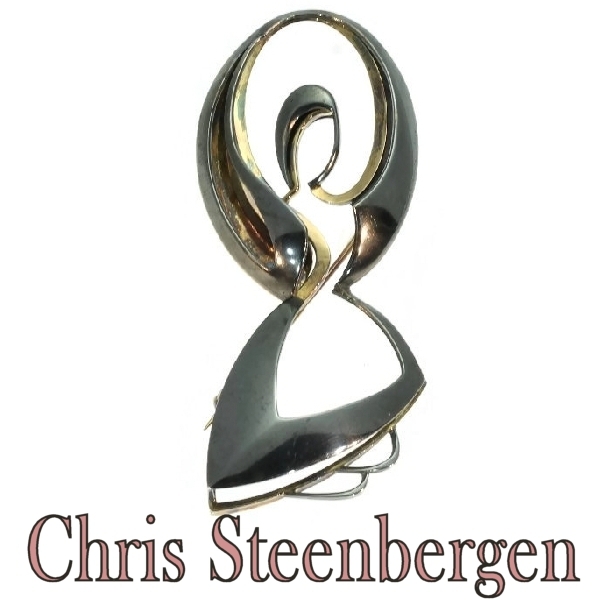 Extra information: Chris Steenbergen (1940-2007) - A well known Dutch artist jeweller goldsmith silversmith. Participated in many exibitions in many countries and is mentioned in many books on contemporary jewelry art. A more extended explanation on his live and works are to be found on our Chris Steenbergen glossary page. Hallmarks: The Dutch control mark representing an oak leaf with the number 585, for 14K gold, that is in use since 1953. The Dutch control mark representing a sword with the number 925 for silver 925 (Sterling silver). In use since 1955. And no hallmarks by Chris Steenbergen (or at least we did not find them).